The Philadelphia Eagles have now lost as many preseason games this year as they lost regular season games last year. They are now 0-3, and the offense in particular has left a lot to be desired. As always, we hand out 10 awards. In fairness, the Eagles weren't fielding their full team on offense, as they were missing Jason Peters, Alshon Jeffery, Nelson Agholor, their top three running backs, and, you know, Carson Wentz. And of course, the Eagles aren't scheming in these games the way they would for an opponent in a game that actually matters. Remember when Nick Foles looked terrible against the Oakland Raiders and Dallas Cowboys to close the 2017 regular season, and a lot of people understandably gave up on him? Well, that won't happen again. I don't think fans or media (or I) will be so quick to throw in the towel on the Super Bowl MVP. But Doug Pederson sure as hell was mad about Foles' performance. Angry Doug indeed! I like it. And Doug should be upset. 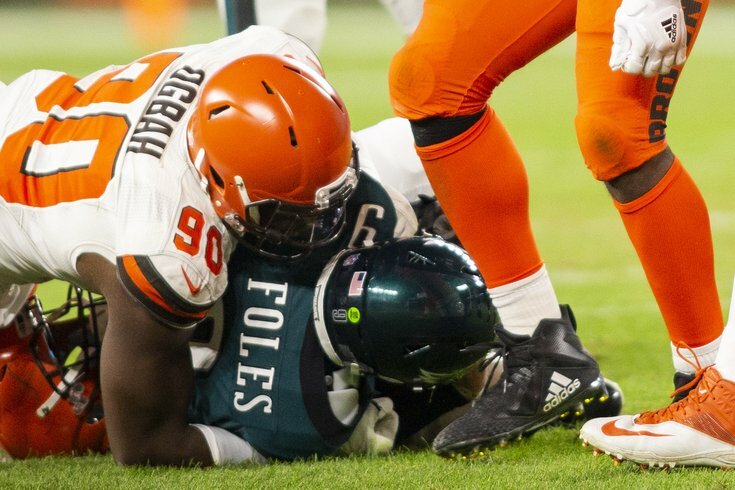 Foles and the first team offense have stunk, frankly, and not just in the game against the Browns. Wentz is a far better quarterback than Foles. Let's just be real. It's a drastic difference. Prior to the game, Wentz got in a pretty good workout, and he even had a little slip that tested how his knee would react. The idea that the Eagles can just sleepwalk through the first part of their schedule with Foles instead of Wentz is insane talk. If the doctors clear Wentz, he's going to play. Period. After dropping 37 passes last week against the Pats, Jones lost a fumble against the Browns. His short Eagles career is about to be over. Smallwood and Adams both showed something in this game. Both backs ran hard and got positive gains when there were openings. If the Eagles' fourth running back is going to be a guy already on this roster, it is going to be either Smallwood or Adams. It is very clearly down to a two-man race. The Eagles' D looked good against the Browns, as they did against the Steelers. There shouldn't be much of concern that they're ready to play heading into Week 1. So there's that, at least. Three offensive linemen went down during the game (nothing serious, it would appear), and Seumalo filled in for all three of them. When Jason Kelce left with what looked like lower back pain, Seumalo filled in at center. When Stefen Wisniewski got dinged up, Seumalo went back in and played left guard. And then when Halapoulivaati Vaitai had to come out, Seumalo played left tackle. Oh, and he was also the tight end in the Eagles' jumbo sets. The Eagles value Seumalo's versatility. He truly is a "jack of all trades," as offensive linemen go. We'll see if he can master one. Whatever the case, Seumalo is a lock to make this roster. For the second game in a row, Elliott missed a 33-yarder. Against the Pats, he clanked a PAT (33 yards) off the upright. Against the Browns, he missed another 33-yarder, this time on a field goal attempt. Elliott is an incredibly clutch kicker with a big leg, but those short kicks remain a concern. I flew out to Cleveland to cover a 5-0 game. This game was as preseasony as it gets, and this was supposed to be the "dress rehearsal" preseason game that's not entirely horrible. Earlier this week, we listed all the players who were nicked-up in some way heading into this game. It was a long list. The Eagles did have something of a scare when Kelce appeared to be in a lot of pain after a play in which he hurt what looked like his lower back. The Eagles have some significant names who remain injury question marks heading into Week 1, such as Wentz, Jeffery, Timmy Jernigan, Brandon Graham, and Chris Maragos. But that's nothing new. The only serious "new" injury from the preseason, that we know of at this point, is third TE Richard Rodgers. So while the Eagles looked very sloppy at times, at least they should at least escape the preseason with no major injuries, as the starters are highly unlikely to participate in the fourth preseason game next Thursday.